I absolutely love working with donated fabrics. You get a bunch of things that were never meant to go together, and you make them go together. Walking on Sunshine is headed to the Community First! village, an innovative housing solution in Austin, TX. What is the Community First! Village? Available exclusively through the Art of the Month Club at Current Studio. Sarah Atlee is the January 2017 Featured Artist for Art of the Month at Current Studio! I am making a series of unique improvisational quilts, 8 to 9 inches square, exclusively for Current Studio. Current Studio features a different artist each month for their subscribers. Join by 20 December to get Sarah Atlee's art in January 2017. In Dot Dot Dash, I set out to explore visual rhythms. We know that I love stripes. Turns out, I love dots too. I had so many fun fabrics to choose from. Some donated to the Community First! Quilters, some I purchased myself. In particular, I've been in love with this Dottie Jean Jacket print by Rashida Coleman-Hale for Cotton + Steel. Does it get any better than strip-piecing? So much fun to quilt this thing! On the back: cream-colored flannel, and a variegated blue thread. Along one edge, Community First! is spelled out in Morse code,using buttons. Light buttons for dashes, dark buttons for dots. Dot Dot Dash was donated to the Community First! village, an innovative housing solution in Austin, TX. 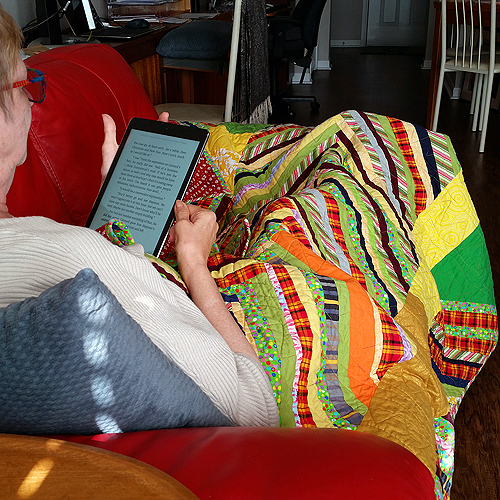 Piece of Pie is a quilt completed in 2016 for an expert pie-baker (and her new baby). I love improvisational curves! There's so much room to make mistakes. Banana-shaped free-motion quilting to go with the upcycled sock monkey bedsheets. 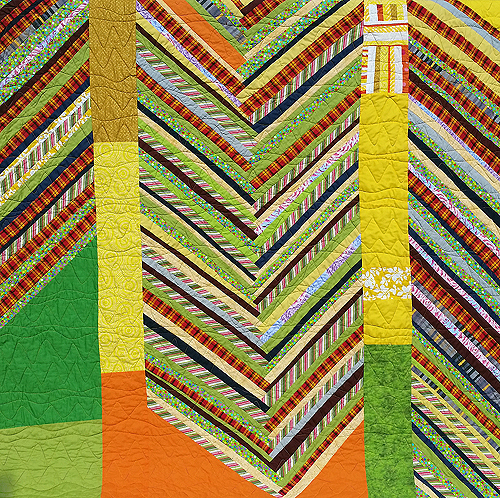 Quilting lines, seen from the back.